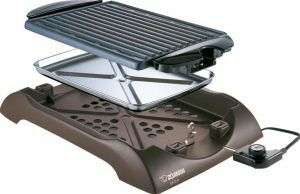 This brand is not very known but we did the Zojirushi electric grill review because they are very good and the people who use them are giving them pretty high ratings. We have found two models that we found are the best selling and who’s users are talking about in a very positive way. Both these Zojirushi indoor electric grill fall in the rules we set for our reviews. 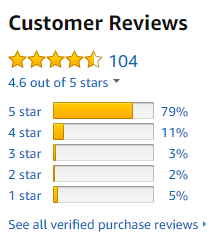 Star rating must be an average of 4 stars or higher and at least 100 people who left a rating for them. Cleaning is very easy with the option to take the grill apart in 3 parts and I love this option. Have a look at the picture to make it clear for you. As you can see it is very easy to disassemble and this makes cleaning really easier. I read some great ratings and opinions about for the Zojirushi EB-DLC10 review that I will share with you here. The grill surface is made of non stick material. It is easy to clean by removing the metal grill part from the base. Just like any grill it might need some scrubbing to become clean of course. One of the most mentioned question was if this grill had the power and temperature to cook and sear a steaks and in all the remarks we read there were several that mentioned that they could cook a nice juicy steak on the EB-DLC10 electric BBQ. It might take up to 10 – 15 minutes to heat up this grill but that is faster than any outdoor charcoal grill in my opinion. I read several people that said that this grill gets very hot and just as hot as any “real” grill. This grill can also be used outdoor I read, but I recommend to keep it under a porch or something it is after all sold as an indoor grill. Overall we can recommend this grill as a very good buy and although the price is a little higher than some other brands it is obvious that you get what you pay for in this case. If you look at the average customer reviews there is not much wrong with the Zojirushi EB-DLC10 indoor electric grill. The things we found out in the Zojirushi EB-CC15 reviews are that many people consider this a great indoor electric grill and BBQ. They grill a lot of things on it. The grill surface we found in the Zojirushi EB-CC15 review tells us that it is pretty big and the grill area measures 12. x 19.25 inch. This makes a total of 115 square inches. Not as big as the Zojirushi EB-DLC10 above but still not much smaller. Enough room to grill and cook a full meal including veggies for 2 people. The total measurements of the EB-CC15 is about 12.5 x 18.5 x 3 inches. Large enough grill area and still small enough for easy storage. Even more people took the time and share their opinion about this EB-CC15 from the Zojirushi company. We found over 450 of them on one of the largest online stores. The Non-stick surface is also slotted so that the grease can run in the removable drip pan very easy. The drip pan is dishwasher safe and can be submerged in water also. The Grill part can’t be submerged or put in the dishwasher and that is something to keep in mind. The drippings will fall in the drip pan, but the frame and grill itself still need to be cleaned by hand. Most things we read about cleaning was that it was very easy and you don’t even need a dishwasher. The grill heats up very fast and the top temperature is about 410 degrees. It stated for indoor use only but I read a few people who used it outside also. Just keep it out of the rain was mentioned in those cases. There were quit a lot of people who mentioned that they also cook their vegetables on this grill and it works good. All together we can say that this Zojirushi EB-DLC10 indoor electric grill can be considered a good buy for you money. You can have a look at all our electric indoor grills here if you look for an other brand.